​NEWS: 26/11/2018 - Temporary Order closure still in effect . Sorry! The cutting season is here again. I have been cutting quite a bit of hazel and sweet chestnut. I still have a pretty full order book already going right through until April 2019 now , for this reason I am sorry to say I won't be taking any new significant orders. You are welcome to ask, but please don't be offended if I have to decline. Please bear with me email wise (if you are already awaiting a reply), I am trying to get through emails AND do the cutting and deliveries so I may be a bit slower than normal on my response times - apologies. If you leave a voice message via my mobile and don't receive a call back within a few days, please consider following up with a text or email as occasionally I can miss voice messages. Email is best, texting is good too, calls just depend if I am in the woods or not. Only the fields marked with * are essential. CLOSED FOR NOW, Please see above, apologies. The contact form usually knows who sent the request, but entering it here ensures good communication, also enter any other email addresses you might need to be contacted on should you wish. Optional detail below - for your information only. 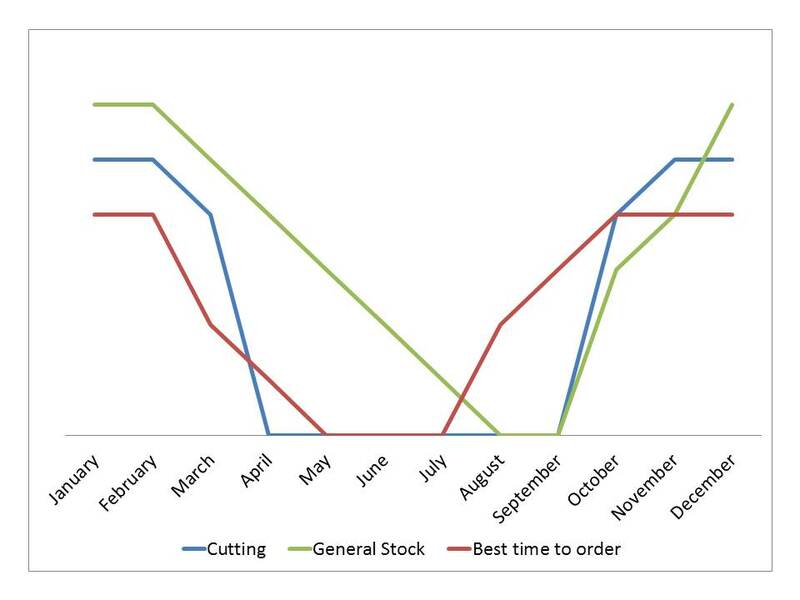 The graph below is a useful indicator regarding ordering, especially of chestnut stakes, poles etc, as well as any hazel product. It shows the months along the bottom with a relative vertical scale, indicative only; tying in when I am cutting/processing last/this winter's felled wood, what my stock levels might be with the most important factor in RED being when during the year it is best to order. It is for information only and not meant to discourage you from ordering at all but I like my customers to understand how I work seasonally in the coppice trade. It demonstrates why September -> February are by far the best times to place any orders, especially large ones. I am GDPR (General Data Protection Regulation) compliant, so if you wish at any point for me to remove details I have about you, submitted via this form, or wish to know what data I have, please ask. Thank You.